It is said that nature always finds its own way of taking care of you. An amalgamation of the extracts of Turmeric, Saffron & White Cherry is what you will find in the all new Turmeric and Winter Cherry, Auravedic Skin Lightening Oil. It is a great skin care oil which helps to uplift the growth rate of the skin cells. Regular application of this product oil helps in the elimination of skin decolourisation. 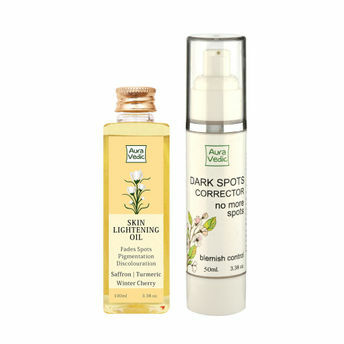 A fast-acting dark spot serum to diminish the appearance of dark spots, age spots, freckles, and hyperpigmentation. This intensive serum improves the look of uneven skin tone, leaving skin looking and feeling completely fresh and hydrated. It reduces the appearance of dark spots, discolorations, blotchiness, and redness while refining skin's texture , resulting in naturally glowing, even-toned skin. No Artificial Ingredients, Fillers, Parabens, Alcohol, Animal Ingredients, Sulfates, Artificial Colors, or Unnatural Preservatives.